Erin Sterner was born and raised in Corning, NY. She attended SUNY Delhi and graduated with her A.A.S. in Veterinary Technology. Following graduation she moved several times, working in areas such as research and emergency animal care before returning to her hometown. 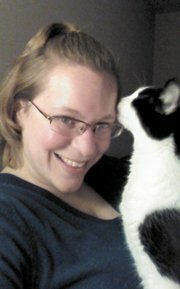 Erin has worked at Lake Road Animal Hospital since 2006, initially as a part time technician, and now full time in a supervisory position. She has been with SOS since 2009. She and her family reside in Elmira. They foster dogs through Rainbow of Hope Animal Rescue, along with taking care of their own furry children.